The media and advocacy groups often refer to climate migrants, people on the move in relation to drought, floods, storms, as “climate refugees”. However, these people are not legally considered refugees. ‘Refugee’ is a legal term which has a very specific meaning centering on a “well-founded fear of being persecuted for reasons of race, religion, nationality, membership of a particular social group or political opinion” (Art. 1, 1951 Refugee Convention). According to this convention, people leaving their countries for reasons related to climate stressors may not be considered refugees because the Convention does not recognize the environment as a persecuting agent. 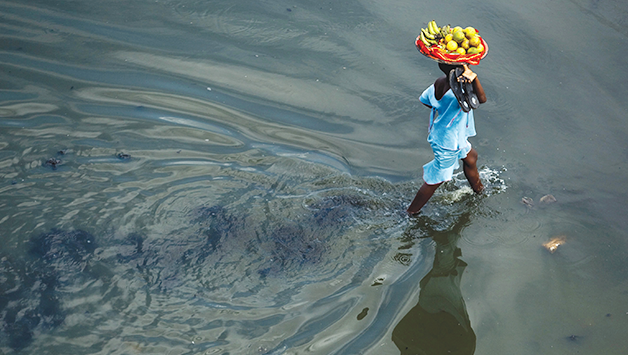 Climate stressors, such as changing rainfall, heavy flooding, and sea level rise, put pressure on people to leave their homes and livelihoods behind. It makes their homes uninhabitable. These people could live anywhere in the world ranging from the Pacific island states such as Kiribati and Tuvalu that are dealing with sea-level rise, to farmers in countries in West Africa who cannot cultivate their crops or raise livestock anymore because of drought and flooding. Countries with a combination of low adaptive capacities, vulnerable geographies and fragile ecosystems (such as small island states, the Sahel Belt and low-lying mega deltas) will face the question: Do I stay or do I go? At the same time, it is often the poorest and most vulnerable who do not have the resources or capacity to leave their homes. The majority of environmentally-induced migrants are likely to come from rural areas, as their livelihoods often depend on climate sensitive sectors, such as agriculture and fishing. However, climate migration out of urban areas is also possible as sea level rise affects the densely populated coastal areas. There are no reliable estimates of the number of people on the move today or in the future as a result of environmental factors. The reason for this is twofold: a difficulty untangling the reasons for migration and a lack of official figures on within country movement. Oftentimes places that experience climate stressors are also affected by conflict situations, political instability, low levels of economic development and human rights abuses. This makes it difficult to establish a direct causal link between the movement of people and the environment. The environment, including climate change impacts, is usually one of multiple factors involved in a person’s decision to leave their home. Furthermore, a lot of movement more directly attributable to climate stressors is within a country (e.g. from rural to urban areas) and not across international borders. This movement is often not officially documented. Fact 5: However, climate migration is a reality faced by people the world over. People are already moving because of climate stressors and changing weather patterns. Whether salinity intrusion in Bangladesh is making it difficult for farmers to continue cultivating rice or flooding in Kenya is killing livestock and destroying crops, people’s livelihoods are being threatened by climate stressors. In many cases, people will adapt to these stressors by migrating. *For the purpose of brevity, in this article we will refer to those whose decision to migrate is related to environmental stressors such as drought, floods, storms, as climate migrants. Though this is not an official term used in policy or academia.